Mr Rafid Al-Mahfoudh is an appointed Consultant Neurosurgeon and Complex Spine Surgeon at Hurstwood Park Neurosciences Centre and Royal Sussex County Hospital. He has dual Orthopaedic and Neurosurgical accreditation in Spinal surgery, in addition to further specialist fellowship training in anterior skull base and minimally invasive neurosurgery in Adelaide and New York. He is the only dual fellowship trained Spine Neurosurgeon in East Sussex. His training includes basic surgical training in Mersey Deanery followed by specialist Neurosurgery training in the Walton centre. The Walton Centre is the only hospital trust in the UK specialising solely in neurology, neurosurgery and pain services. This was followed by highly competitive subspecialist fellowships in Orthopaedic spinal surgery in Brisbane and further sub specialist training in anterior skull base, pituitary and minimally invasive neurosurgery in Adelaide and New York (Weill Cornell Medical College). He has been the recipient of many awards, including a Nuffield Health scholarship, travel awards and presentation prizes. He has been an invited lecturer by industry and international surgical societies. 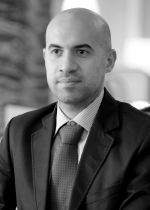 Mr Al-Mahfoudh has extensive experience in treating spinal disorders, pituitary tumours and endoscopic neurosurgical techniques. He has specialist interest in degenerative spine disorders, spine tumours and pituitary adenomas. In addition he maintains a general neurosurgical practice. Mr Al-Mahfoudh is active academically with over 40 articles in peer reviewed journals. He is in the process of writing a dissertation to complete his MSc from Oxford University. He is honorary lecturer at the University of Liverpool and is also reviewer for the British Journal of Neurosurgery and member of the British association of Spine Surgeons, Society of British Neurological Surgeons and European Association of Neurological Surgeons. Mr Rafid Al-Mahfoudh does not hold a share or financial interest in this hospital, another Nuffield Health hospital or the company. Mr Rafid Al-Mahfoudh does not have a share or financial interest in equipment used at this hospital or another Nuffield Health hospital. Mr Rafid Al-Mahfoudh does not hold any paid advisory role(s) at this hospital or on behalf of Nuffield Health.